Turkish police have fired tear gas and water cannon at people trying to enter an Istanbul park that was the focus of last month’s anti-government protests. Istanbul’s governor reopened Gezi Park – next to Taksim Square – to the public earlier on Monday, but shut it again after protest leaders called a rally. The park had been shut since 15 June, when police ejected people occupying it in protest at redevelopment plans. The authorities’ response to the protest sparked nationwide unrest. Four people were killed and thousands more were injured as police cracked down on anti-government demonstrators, who accused Prime Minister Recep Tayyip Erdogan of becoming increasingly authoritarian. Hundreds of people flocked to Gezi Park on Monday afternoon after Istanbul governor Huseyin Avni Mutlu declared it open once again. Mr Mutlu said staff had tried to improve the park while it was sealed off, planting additional trees and shrubs and replacing damaged grass. But, in a clear warning to protesters, he also warned that it was no place for “forums, occupations or marches”. “Blocking the parks, making them areas for demonstrations, preventing children, elderly and [others] from using these areas and turning this into a security problem – we would never ever allow that,” he told reporters. Taksim Solidarity, a group of political parties and non-governmental organisations, subsequently called a public meeting in the park at 19:00 (16:00 GMT), prompting the authorities to close it after only three hours. Dozens of people were forced to leave by police, who used their shields to eject some who resisted. 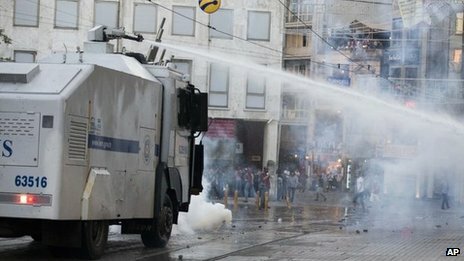 Officers then used tear gas and water cannon to break up a crowd of several thousand people marching along Istanbul’s main shopping street towards Taksim Square, according to the Reuters news agency. On Saturday, police prevented thousands of people trying to enter Gezi Park as part of a rally called by Taksim Solidarity to serve notice to the authorities of a court decision that annulled the redevelopment plan. An administrative court said locals had not been consulted sufficiently about replacing the park with a replica of an Ottoman-era military barracks and a mosque, and that the work would not serve the public. However, the ruling is not final and the government is expected to appeal. This entry was posted in News, Protests in Turkey and tagged BBC news, news, Protests in Turkey on 8 July 2013 .